February 19th, 2018 was a big day in the history of beach soccer in the United States. It’s the day two of the largest soccer organizations in the world for coaches and youth players recognized beach soccer as a sharp tool found in the shed for developing players to a higher potential. 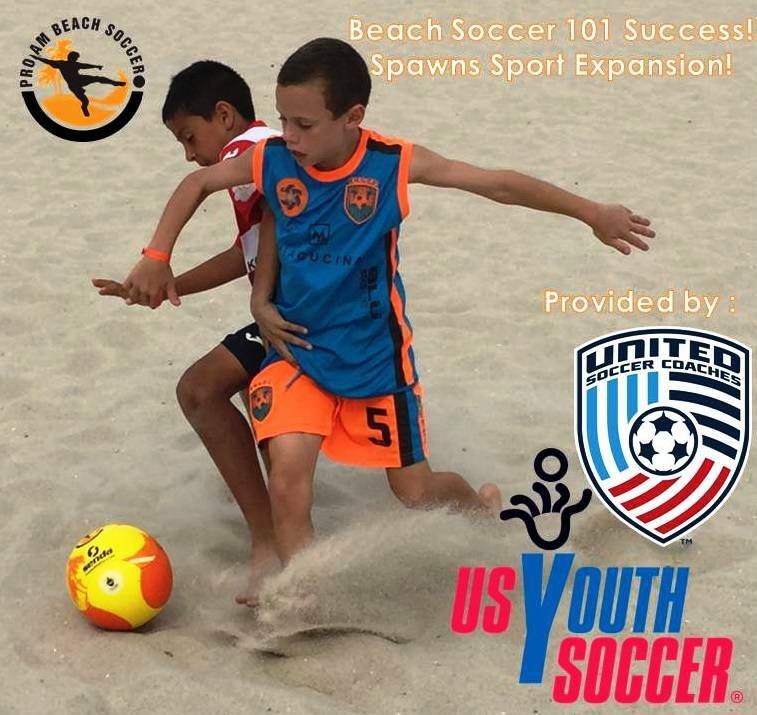 The educational session named “Beach Soccer 101” was introduced by the United Soccer Coaches (formerly “The National Soccer Coaches Association of America”) and sponsored by the United States Youth Soccer Association as a teaching tool for the development of players through the sport played in the sand. 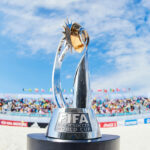 Beach Soccer which FIFA describes as the “Celebration of the Beautiful Game” got a long awaited shot in the arm in the United States. 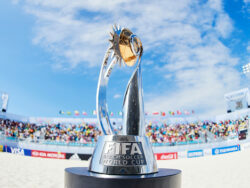 FIFA and Beach Soccer World Wide, based in Barcelona, have been waiting patiently for the sport to grow in North America. This introduction will spark further confidence in the direction of the growth of the game, but has also given coaches, directors, and state associations a glimpse at a revolutionary way to improve the standard of play on grass in the United States. This shift to include beach soccer as an educational tool by both organizations has also been well received in state associations as executive directors and/or their representation came away looking to be part of the US Beach Soccer National Championship in 2018. It presented opportunity for state associations to add to their offer to clubs and players to develop. They now have a reason for coaches to train their players in this medium and to increase their soccer acumen exponentially. The session itself covered a large range of subjects important to the sport. It began simply with “Why Beach Soccer” which clearly defined the expediency in which coaches can take advantage of the S.A.Q.’s (Speed, Agility, Quickness) not only more creatively, but much quicker than any avenues they have explored previously. For example, the idea of “Running in High Heels” which I have been touting for years is a perfect illustration of how a player builds and strengthens tendons and fast twitch muscle fibers to make them faster and stronger when returning to grass. In addition, it addressed the emphasis of the last decade, or more, of moving away from flighted balls to the “tiki taka” short controlled passing game. This inevitably has led to players losing composure to address the ball in the air. We all want our players to play in tight possession, but we also have a clear sense of reality when these kids are under pressure, a vast majority, will put the ball in the air especially if a wide player looking to unload a cross. But, we don’t emphasize it nearly as decades gone by. 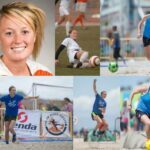 Beach Soccer emphasizes everything players don’t train on the grass, and with what we do, it adds an incredibly different element changing the players perspective. Earlier kids are mastering the “three small toes” for scooping and flicking to teammates and essentially giving them great familiarity with addressing flighted balls. Not to mention greater strength and comfort in passing/striking using the outside of the foot. Whether we are speaking to better balance, concentration, composure, or striking the ball off the uneven surface the beach offers a plethora of opportunities for technical and tactical ideas which are new and challenging to a young player thirsting for greater knowledge. This while creating greater interest and increased motivation. Players cannot hide in the sand and must move, so the effort you will see from your players will also surprise most coaches at first. Then they can use this to their advantage in a multitude of ways which will improve learning and the excitement of new challenges and skills which have not been tried in the grass…including the bike kick! Ko Ishikawa, a Bolivian, Tahuichi 80’s/90’s player, in the era of Marco Etcheverry, and now coach of the Japanese Profession team Tokyo Fusion once commented to me, “Of all the types of futbol one can compete, Beach Soccer more than any other, by far takes the most technique, and is without a doubt, the most tactical and strategic one can play“. So simply putting them in the sand in a fun environment not only creates an alternative way of thinking and approaching the game, but in turn makes them stronger, faster, and smarter when they return to the grass. The presentation continued by introducing specific rules needed to be understood, as well as what a 2 hour progressive technical/tactical training session could look like, in the sand. It addressed the importance of the goalkeeper, who is considered the quarterback and most important player on the team, as well as the emphasis needed on set pieces and the importance of the composure needed to be taught not to foul. It wrapped up with videos and illustrations on how to begin to teach your players how to bike and/or overhead kick. This is not only fun for the kids, but from my personal experience of over 25 years of coaching on the grass it leads to more fantastic goals from your players as their confidence and concentration of meeting the ball skyrockets with this introduction and continued practice of this skill. Their bodies will move and adjust in ways you will have never seen before introducing them to the beach. 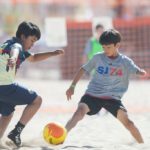 We have gone into decent depth in regards to explaining how there are so many benefits to introducing your young players to the technique and tactics of beach soccer. We can all honestly understand this and know the fact it’s a fun and alternative way to get more out of your players. Not to mention, the proven bonding experiences we have seen from clubs coming to tournament in force with 20 or more teams as the chance for the club to come together closer as a community with a weekend on the beach. But outside of the obvious, what other practical ways can these skills truly be those sharp new set of tools to be taken out of the shed? In speaking to one of the Directors of Coaching in California about beach soccer he stated I was speaking to the choir. Josh Kalkstein, Technical Director of Soccer Operations at Marin FC Alliance, reminded me how in the community we no longer play in water bogged fields. Whether this is due to field turf conversions, or because the new generation of players don’t get their “feet wet” like they used to, it was clear where he was heading. He described a recent trip his Northern Californian team took to a DA (US Development Academy) showcase competition in June of last year in Indiana. On the last day of the event it was pouring rain and the field was more than ankle deep with water. The players were at a total loss as they tried to kick the ball harder throughout the first half, which we all know simply just wears them out, with more frustration than progress. It was clear to him the other teams based on the east coast had more experience playing in those conditions. At halftime he explained how he tried to tell the players they needed to get the ball off the ground, out of the mud and water, and keep the ball in the air. The players were amiss and the logic just didn’t settle in as they had never been trained in a way to lift the ball and carry on in the air. But with his advice and constant reminders they picked up on it in the 2nd half and improved their play. But, the reality was it was June in Indiana, and who would of thought, as they didn’t have rain gear as they were fatigued and frozen to the bone by the end of the first half with more interest in the hot shower at the hotel than getting the result. He clearly stated if his players had ever trained in the sand and developed those techniques then the ideas he was expressing would not have been foreign to them. Kalkstein believes they definitely would have had more success and quite frankly fun playing in the difficult environment if they were not fatigued by half time. Having played on the beach himself over the last few decades he hopes to see greater emphasis as he realized how much it would have helped his team. This funny enough was a new concept even to myself which I could not help but include as yet another practical illustration on why the fundamentals of beach soccer help improve a players. The ability to play with a different frame of mind gives them a sharp advantage over other players who have not. Maybe if they had the experience of lifting and scooping they would have been able to maintain more strength throughout the match? Maybe they will get the chance to find out in the future? It is not difficult to understand the advantage a team would have in those conditions with beach skills. At the end of the day, let’s just talk facts. Beach Soccer offers players an alternative opportunity to enhance their soccer acumen, develop quicker, stronger, and faster players. The game itself averages 9 goals per game with a shot every 30 seconds. Player’s cannot hide in the sand and simply work harder and improve quicker in many aspects which are almost entirely transferable back to the grass game. This is NOT ROCKET SCIENCE. There is a reason why Brazil is Brasil and whether you talk about futsal or beach soccer this is something the United States needs to put more emphasis on. We need to create better players for the future, so we don’t embarrass ourselves with another exclusion from the World Cup. Europe, Africa and even Asia have discovered this as their beach national teams have also excelled in recent years, but here in the United States with the emphasis more on the youth it will pay dividends across the board in the future. So the moral of the story is learn how to teach it! If you want to have more information on how to train your players in beach soccer you can go to YouTube station called “YourBeachSoccer” for about a dozen examples of training opportunities to prepare your players. 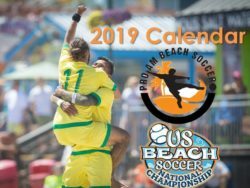 Also, watch out for the dates of the US Beach Soccer National Championship Qualifiers taking place in 8 different cities around the United States. First qualifying events are taking place May 4/5 weekend in Atlantic City, New Jersey and Oceanside, California. 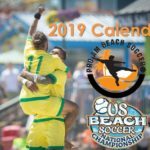 Got to www.proambeachsoccer.net for updates and information as it becomes available. 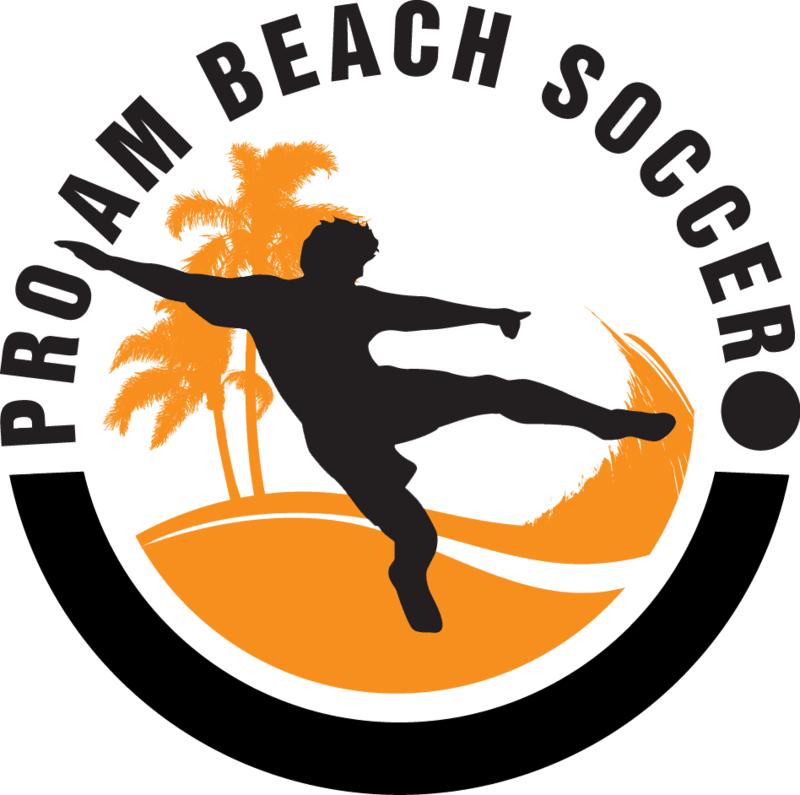 Hi – my son plays traditional soccer in Fresno for the Cencal Cosmos – I am planning to bring him to the ProAm Beach Soccer weekend at Santa Cruz next weekend – will there be any activities for outsiders? quick games or things he can do while we are visiting?